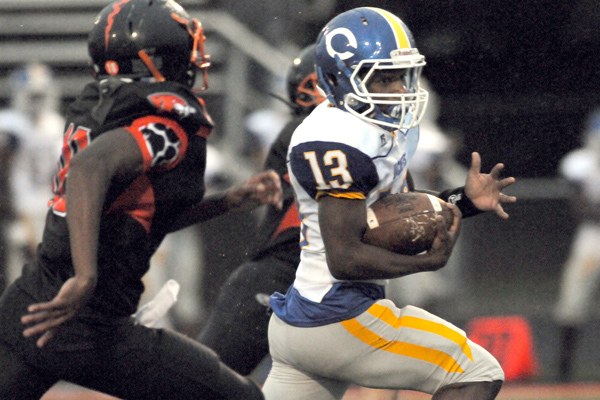 In didn't matter for the Yellowjackets (2-1) as they topped Oak Grove (0-3) 36-13 in the Class 3 matchup. Center spread the ball among six running backs to get the job done. Junior Cris Ferrer and sophomore Sheron Manning led the way, each scoring twice for the Yellowjackets. "The veterans on our team are on our offensive line," Bryan DeLong, Center head coach said. "We always feel like we can put three or four running backs out there that are quick and athletic, and we feel like we have that again. Ferrer had a big game and some nice big runs. Manning's a new kid to us and obviously talented and give us an extra punch." After Center took control early with two first-quarter touchdowns through the nagging, soaking rain, Oak Grove was able to strike back in the second quarter with a 66-yard bolt from sophomore tailback Nate Foster. It may have helped provided a little bit of spark this young team needed going into the second half. Both teams exchanged scores in the third frame, but Center added one more in the fourth to seal the deal.